STORRS - The University of Connecticut's incoming president says he's committed to a major college football program and doesn't plan to move the school out of the American Athletic Conference. 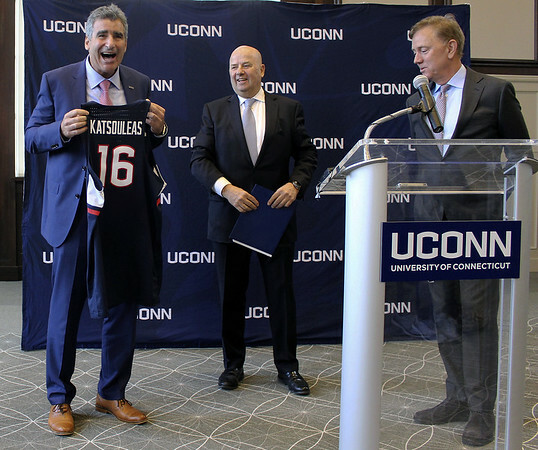 “It's important to both (athletic director) David (Benedict) and me that we build a culture of winning at UConn and leverage that culture of success to benefit every aspect of the university, including academics,” Katsouleas said. “Right now we're in a good conference and we're committed to building that conference up,” Katsouleas said. Posted in Newington Town Crier, UConn on Tuesday, 5 February 2019 19:13. Updated: Tuesday, 5 February 2019 19:16.